Corrective actions and preventive actions (CPAs). managers are not "forced/required" to document CPA performance activity. Overdue reported safety issues also provide considerable intelligence to the accountable executive. When the accountable executive reviews hazard reporting metrics, not only will the accountable executive (and safety team) be looking at whether reported safety issues are being closed on time per your risk management processes, but they also should be reviewing whether the volume of reported safety concerns are commensurate with the size of the organization. lack of safety promotion activities? resistance from particular department heads? In short, reported safety issues and CPAs can tell a lot about the performance of the SMS. When your SMS has many safety issues and CPAs being neglected and not closed on time, the accountable executive is responsible for bringing the SMS into compliance. The accountable executive is responsible, but does your accountable executive have direct access to SMS performance charts and metrics? Accountable executives don't have time to comb through spreadsheets and SMS databases to look for clues. Simple risk analysis charts allow managers to focus on problem areas by seeing aggregated data formatted in a manner to facilitate timely and accurate decision making. An exceptionally powerful risk management chart is an "Overdue Issue and CPAs Chart" that you can create or you may already have available in your SMS database. We'll discuss this intuitive chart design that every safety team should have. It is especially easy enough for the accountable executive to monitor SMS performance at a very high level. I'm not saying that this is the only chart that accountable executives should have access to, but it is one of the most valuable for reviewing reactive risk management activity early in an SMS implementation. As the organization's SMS' safety culture matures, this performance monitoring tool will only require a quick glance to determine whether there are any major obstacles with the SMS. 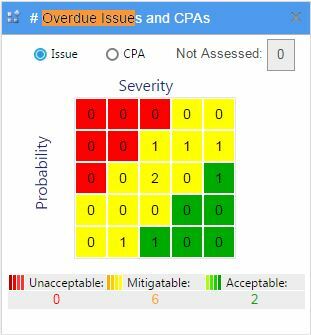 The Overdue Issue and CPAs Chart (like the one to the right) is very useful in your organization to more than the safety team. When accountable executives have unfettered access to such a report, they can take immediate action if it is available. I highly recommend aviation SMS management teams keeps it close at hand. Corrective Preventative Actions (CPAs) that are currently overdue (i.e. are passed their assigned due date), as sorted by the parent issue’s assessed risk level. It’s important your aviation safety management process is proactive and timely about closing safety issues and corrective actions. Overdue SMS tasks may mean unmanaged and uncontrolled risk. Another possibility for seeing high numbers of overdue SMS items is that your risk management processes are too unwieldy and don't allow for adequate time to properly treat and document safety concerns. Interpreting the root cause behind many overdue SMS tasks requires common sense and looking at the big picture. Don't always assume there are shirkers or those apathetic to your SMS. It may be your processes. It may be expectations are not communicated fully. You can also see which SMS tasks are overdue by selecting a cell in the risk matrix where overdue items appear and be taken directly to selected item(s). Your SMS has a safety performance monitoring and measurement requirement that allows aviation service providers to demonstrate continuous improvement of the SMS. Management may detects that the rates for overdue tasks are becoming a concern. In these cases, corrective action is required to determine like causes. Again, don't think the worst about employees unless there are obvious signs of resistance to the SMS. Active and responsive your department heads are (with CPAs). It’s a simple chart, but because overdue items say so much about SMS performance, you can derive many quality assessments about the quality and dedication of your aviation SMS. Through trends you notice in this chart over time. That if you do have overdue items, that most or all of them are in the Acceptable range. An increasing trend of overdue items. determining responsiveness over time and by risk level. Department heads with risk acceptance authority manage corrective and preventive actions (CPAs) to reduce risk to ALARP. If safety issues or CPAs become overdue, this chart will update with the issue based on its assessed risk level. Of course, this can be done manually or with in-house, non-commercial SMS databases, but it would require some tricky filtering and more manual work than any manager would be willing to give in a real world scenario. An SMS database is obviously the best technology to drive this SMS performance monitoring chart. Not only is the data centralized and accessible by many managers in the decision making process, but the data is real time to give managers the most accurate results whenever they refresh the chart. While not necessarily strictly related to aviation SMS requirements, it will definitely affect continuous improvement in aviation SMS. The quicker hazards and risk are identified, prioritized, and controlled, the quicker the program improves. Moreover, if an aviation SMS auditor shows up at your organization and finds a pile of overdue issues, chances are they aren’t going to ignore it. I’ll let your imagination complete this scenario. Who Should Care about This Chart? This chart is definitely the business of every employee participating in your aviation safety management system for different reasons. that risks are being prevented, corrected, and detected. If issues are constantly overdue, then it means management is slow to mitigate/correct issues, and that the safety culture in management levels needs serious improvement. This is what line employees may think, but in reality, your responsiveness to treat risk may be due to oppressive or outdated processes that don't fit the reality of extant operations. Management may not want line-level employees to access this report. There are a few very transparent safety cultures, but most companies are advised to restrict access to this chart by only management. You may not want this chart appearing on the front page of the daily newspaper. You will make this call based on your SMS performance and the level of transparency in the aviation SMS. Management and executives should be concerned about their performance, especially when this chart is routinely scrutinized by the accountable executive. Their primary safety responsibilities are simply to manage and correct issues as soon as they can. When that is not happening, then the risk management program is not functioning. Executives should likewise be concerned that their safety budgets are being used efficiently. You can easily create another risk management chart that relates very closely to this one, but add a different twist to monitoring performance. Instead of monitoring only overdue tasks, you can create another chart with the "Number of Unclosed Issues By Risk." This chart can displays similar information (but does not display CPAs), with the same functionality for clicking on a box and being taken to relevant issues. For other reasons that will require further investigation, such as in the case where the overdue issues account for most of the unclosed safety issues as well. If you don't have the ability or budget to build these aviation SMS performance monitoring charts, we can help. We provide a complete SMS database solution to allow you to have the baby, but without the labor pains. Not Ready for Live SMS Demo? Looking for ideas for your own SMS database? Our competitors watch our videos, so maybe you can be inspired too. Published September 2016. Last updated January 2019.